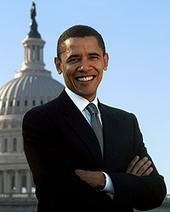 This directory page will help you find our Barack Obama pages. Our goal is to help you learn more about Obama. We have also listed pages about the election itself, pages about the other Presidential candidates, and pages submitted by our readers. After you've had a chance to read what other readers think, take a few minutes to add your thoughts. By publishing these articles, we strive to help you be a better-informed voter. The selection of our President is a topic many Americans don't take seriously enough. We hope these articles will help convince you that this is a subject which has a significant impact on our daily lives and our future, and shapes the America we leave to our children and grandchildren. Will it be the America we grew up in, or something vastly different? Senator Joe Lieberman urges non-partisanship and explains why we must vote as Americans, not Republicans, Democrats, or Independents. To find out which candidate's views are closest to your own, take the survey at the Minnesota Public Radio site. You can also view the cumulative data and the candidates' positions on the major issues by clicking on the tabs. A historical perspective on the War on Terror. The Financial Bailout Bill and what it does. Congressman John Murtha refuses to meet with Iraq vets -- his office calls Capitol Police when a Blue Star Mom gives them a piece of her mind! Voice Your Opinion! Join our discussion about the election. Tell us which candidate you support and why.